I am currently building an FMCW radar. I do not have all the parts finished so I made a doppler radar from the parts I had on hand. Basically a Doppler radar is a type of radar which measures speed of objects in front of it. The transmitted signal is mixed with the received frequency in a frequency mixer. If an object moves in front of the radar, the received frequency is slightly changed due to the Doppler effect. When these two frequencies are mixed together you end up with a spectrum which contains the frequency difference of the two signals which is directly related to the speed of the objects in front of the radar. In a nutshell this type of radar does not give out any signal if there is nothing moving in front of the radar. If something moves in front of the radar the resulting frequency spectrum contains a frequency which is directly related to the relative speed of the object. Doppler radars are widely used in automatic door openers, speed guns and as early aviation radars. 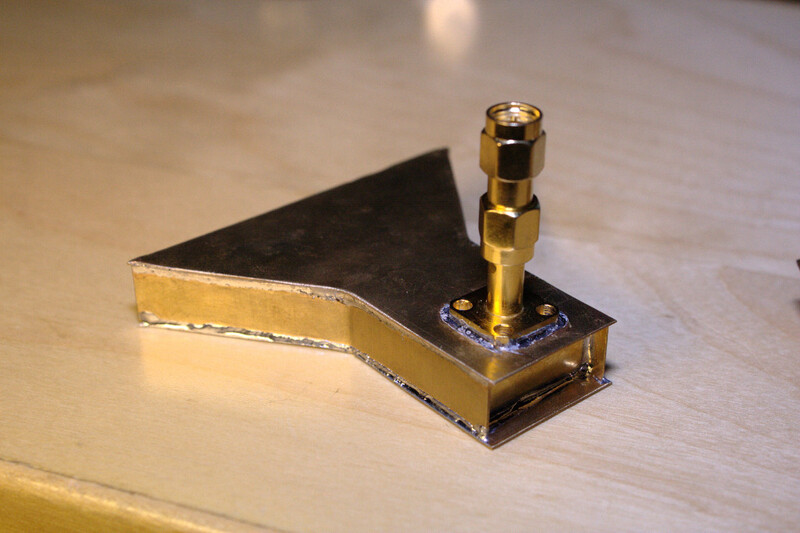 The antennas are H-plane sectoral horns made from brass sheet and soldered together. I measured the matching by using a 20dB directional coupler and measuring the output from the isolated port (with my HP 8592A 22 GHz spectrum analyzer) to figure out the return loss. 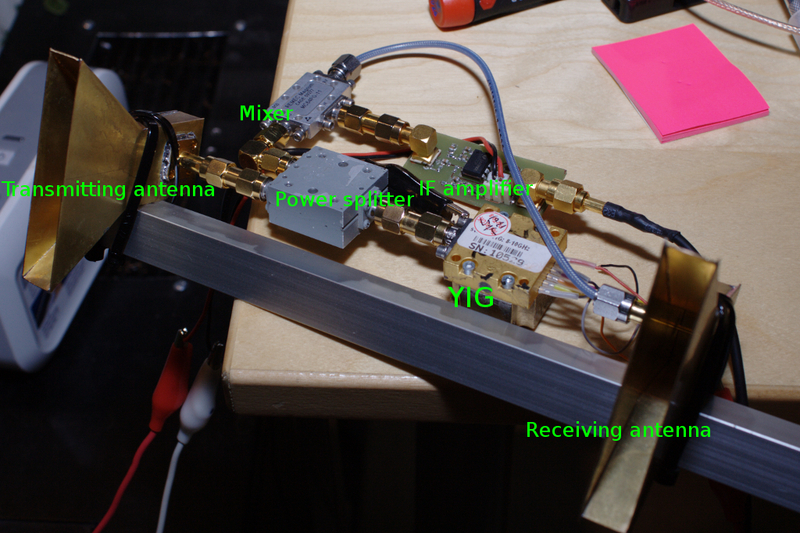 I could only do measurements within 8-10 GHz with the YIG oscillator I have and the antennas seemed to perform pretty well. The worst matching was around -10dB around 8.3 GHz and best at 8.8 GHz at over -20dB. 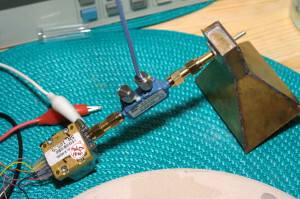 This way of measuring the return loss is not too accurate due to the low directivity of the directional coupler but it is good enough for coarse measurements. I measured the directivity of the directional coupler I had at around 28dB. Datasheet for the coupler says 17dB in minimum. I also made a pyramidal horn like the one in the picture but it turned out quite ugly so I decided to just use sectoral horns because they are easier to make. I also experimented with a tuning screw directly above the feedpoint but it did not seem too useful. I could only tune the antenna by 3dB or so. The radar is fairly simple. I have named all the components in the picture above. 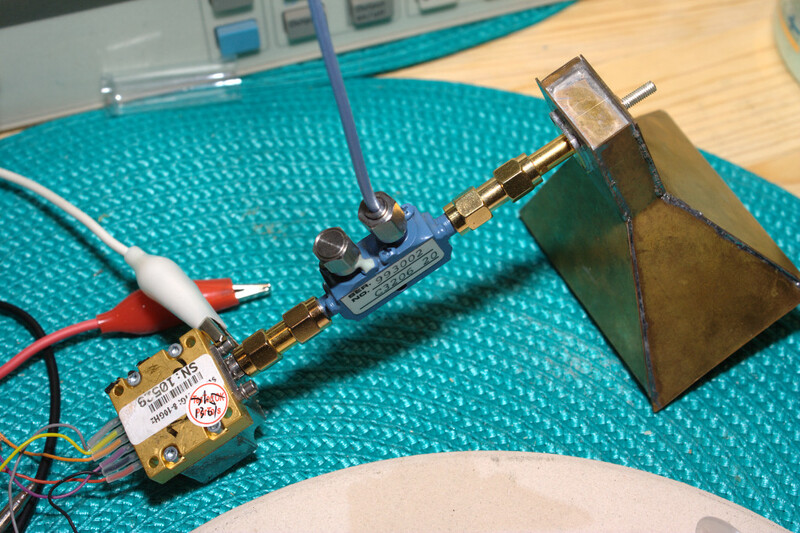 I am using a 8-10 GHz Stellex YIG-oscillator as the signal source. 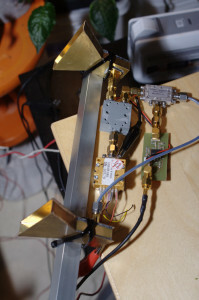 The output from the YIG is around 9 GHz at 15dBm. The signal then goes to a power splitter which splits the signal to the transmitting antenna and to the mixer. 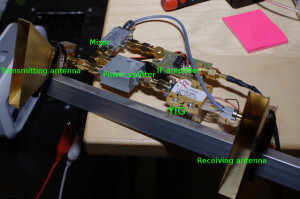 The mixer mixes the signal coming from the YIG and the signal received by the receiving antenna. Any moving object in front of the radar will cause a doppler shift in the received frequency which will be seen in the mixer output. 1 meter per second is about a 30 Hz doppler shift at 9 GHz. In theory I should be able to see speed from way under 1 m/s to mach 2 (~20kHz doppler shift). There is a simple OP-amp circuit with two series amplifying stages to give a gain of around 10000 to the IF signal. The signal then goes to my computers sound card. The IF-amplifier is not that great, it basically should have some kind of an automatic gain control circuit. With just an amplifier the amplitude is way too big with objects close and then drops off very fast with distance. The output from the radar goes straight to my computers sound card and is then played through the speakers. Great Job!! I was wondering how much power the antenna consumes? Dear Kalle, I’m very interesting with your activity. Where I can get to buy that’s RF component ? How much the price estimate we have to spent of money?. Would you like more information about that to me? once i have seen an fmcw radar, which was made to check the borders of a country. what do you think could it work, and if not then why not? Hey Marcell! Yes using a differentiator is a common technique with FMCW radars and is a good idea. I’m going to use one on my FMCW radar as well. I have a 10.250 GHz Gunn diode here and a somewhat working (emits but needs TLC) Gunnplexer with diode fitted. Turns out after dismantling the Tx stage that the problem was a shorted tantalum capacitor not the diode, so put it all back together and it worked. If you’d like them send a PM to mandoline at cwgsy dot net and I’ll see about posting them. Also have LOTS of other Tek scope goodies such as gold ceramic leaded ICs and transistors, don’t want money for them but would prefer they went to a good home. Very interesting. Thank you for sharing your amazing work with us. I cannot wait to build this FMCW radar for myself….